The popularity of online peer-to-peer platforms for buying and selling things is unmistakable. Websites that allow consumers to interact to sell household items, vehicles, furniture, and just about any other item to people in their community are highly popular. There's just one problem. Assuming you aren't shipping the item to the buyer, the buyer and seller have to meet somewhere to execute the deal. Since the two parties have probably never met before, there could be some concerns about safety. For example, some of these online transactions have been linked to violent crimes, which might make some consumers leery of meeting a potential buyer who is a perfect stranger. So at least one of these online platforms, Offer Up, has staked out safety as a key part of its mission. "Whenever possible, meet at a public location such as a cafe or shopping mall," the company advises. "Take extra caution when meeting for a high-value item, and consider meeting at your local police station." But finding a safe, highly visible place in a rural area is more challenging than in the suburbs. There aren't that many cafes or shopping malls. So the company has produced signs, designating the area around the sign as a safe transaction place, and sent them to small town police stations. One arrived at the Northumberland County, Virginia Sheriff's Department. "It's actually something that we had been talking about for a while," Northumberland County Sheriff James "Doc" Lyons told ConsumerAffairs. "We haven't really had many problems with this but it just seemed like a prudent step." Lyons had the sign installed in front of the sheriff's department building, which is located in a central part of the sparsely populated county in eastern Virginia. The sign identifies the area around it as a safe place in which to carry out a transaction with a stranger. "Not only are there always law enforcement officers nearby, the location is well lit and is videotaped around the clock," Lyons said. 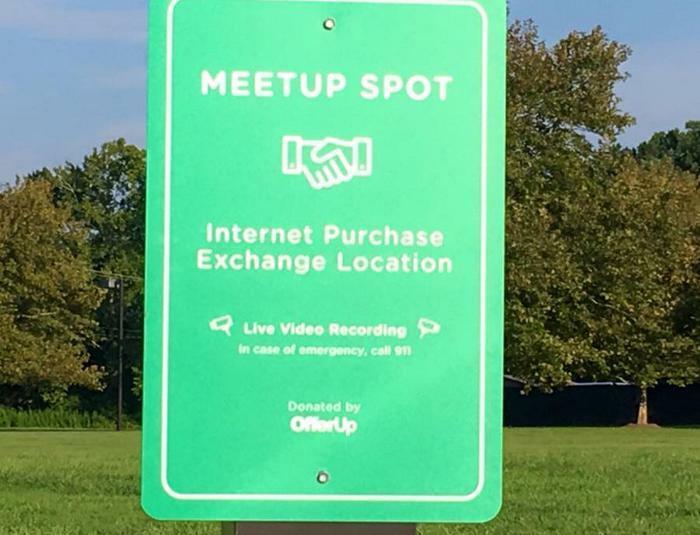 For its part, Offer Up says it has sent out around 5,000 "meet-up transaction site" signs to local police departments. Other peer-to-peer transaction sites are also pushing safety. Craigslist, one of the oldest and most widely used, urges users to exercise "common sense" precautions. Among its advice -- always meet in a public place, avoid inviting strangers into your home, and always tell someone where you are going when you meet a buyer or seller to complete a transaction.